Savory, sweet and pancakes — can they play together nicely in the sandbox? 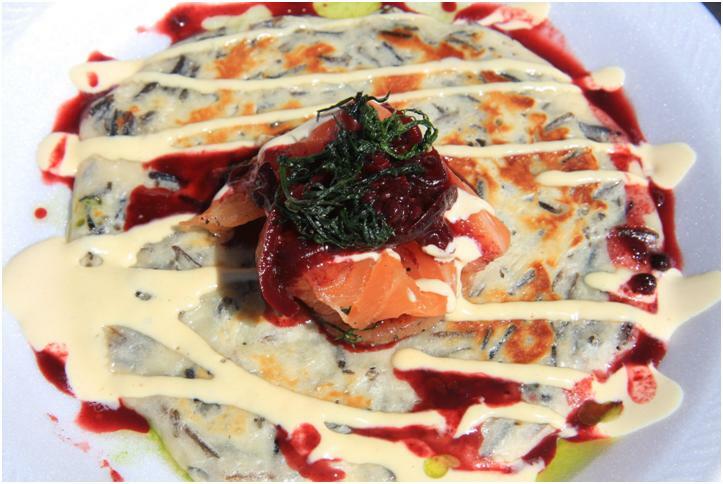 This dish — which combines a wild rice pancake with Gravlax (a traditional Swedish cured Salmon dish) and a Spicy Blackberry Relish (the Scandanavians might have used Lingonberry) shows they can. It is, in a sense, a double play. On the one hand the dish – with its pancakes and berries – is a play on a Scandanavian breakfast dish. But it is also a play on the traditional Russian blini dishes I knew from my Ashkenazi Jewish heritage.